Studio cameras reveal the moment Simon Barnett discovers he’s been hosting a show for ten years with a fake Gary McCormick. 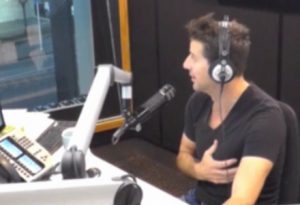 MoreFM host Simon Barnett has been the victim of a deeply personal prank this morning, as he learned live on air that his co-host for the last ten years has not been the real Gary McCormick. McCormick joined Barnett on MoreFM’s breakfast programme in 2003, but departed in 2007, and was replaced by long-time Gary McCormick impersonator Hank Acreman, all without Barnett’s knowledge. Initially intended to be a short-lived prank, no one had the heart to tell Barnett the truth after seeing how well he got on with the new, fake Gary, and so Acreman became the permanent co-host of the show, pending a final reveal that never came to pass. But on this morning’s show, the truth finally came out. Just after returning from an ad break, Barnett was engaging in friendly banter with his co-host, when producer Samantha Baxter finally felt it was time. “Simon, that’s not the real Gary,” she said. “No, Simon, not just today, he’s… he’s been gone for ten years,” said Baxter. Barnett sat in baffled silence, a look of fear on his face. “You’re not serious?” he asked. “I told you my deepest secrets!” protested Barnett. Barnett stared at the ground in silence, saying “Oh my god” to himself over and over, as the show cut to advertisements. In an unrelated incident this week, The Edge’s Dom Harvey has been in a state of dismay after learning that he is the real Dom Harvey.